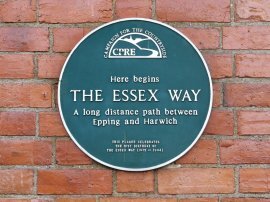 The Essex Way is going to be my main walk for 2009 and I walked this, the first stage on 11th January 2009. The walk is fairly short, at just over 80 miles long, however as the transport links along the route look generally poor I hope to walk it in 11 or so circular walks. 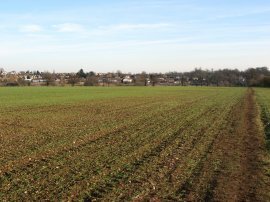 I had been going to start the walk in Harwich and head back towards Epping but I have decided to walk the other way, starting the sections close to home during the shorter days. I have already walked the first 12 or so miles of the path a few years ago and it will also be good to redo this part at the start rather than the end. Driving up from Walthamstow I parked at the large Epping Forest tube station car park, which on Sundays costs just £1 for a days parking. 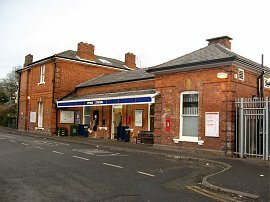 The station, photo 1, is the start point of the path and I was pleased to see a plaque on the station wall, photo 2, marking the fact. As well as marking the start of the walk the plaque was also celebrating the 21st birthday of the path in 1993 - who knew recreational trails had birthdays! Leaving the station the path takes a footbridge over the tracks and heads the short distance down Hillcrest Way to Bower Hill. Here the route turns briefly to the right before crossing the road and taking a footpath that runs down between houses and Bowyer Court into a field. Leaving Epping the Essex Way heads over a couple of fields, down to a Stewards Green Road where the route turns left and then left again to head up the narrow, in places quite muddy, byway of Stewards Green Lane, photo 3. One thing that I immediately noticed is that since I had last walked the start of the Essex Way the route has now been extensively waymarked with the poppy logo that appears at the top of the page. Last time I had encountered very, very few waymarks on the stretch of path I walked. The route follows Stewards Green Lane down to rejoin the road at Stonards Hill where the route turns to the right and heads alongside the road for a short distance, passing the Theydon Oak pub before taking a footpath off to the left. This footpath runs to the left of a small house, just before the road bends to the right. 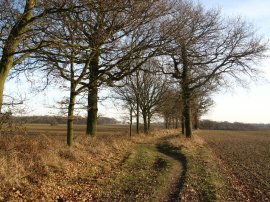 It heads over a small section of scrubby ground before entering a larger field, the footpath heading diagonally to the left across the field to reach the edge of the field. The path then follows the field edges up to Gernon Bushes, photo 4. 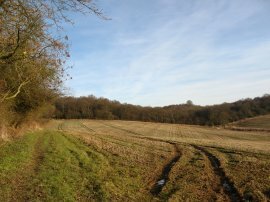 As I was along this stretch of path I saw a lone buzzard circling over the woodland, something that has become a much more common sight in this part of the country just recently. 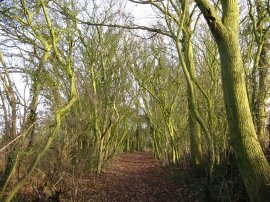 Gernon Bushes, now managed by the Essex Wildlife Trust, is the last remnant of the Coopersale Common and contains many ancient Hornbeam Pollards, photo 5. 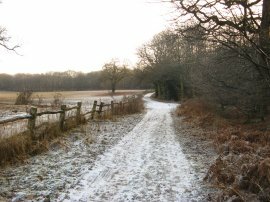 The route enters the woodland by a fine carved wooden bench before turning to the left and then following the path round to the right. The route briefly leaves the woodland to pass through Coopersale cricket ground before re-entering the woods and continuing ahead to a broader path where the Essex Way turns right to soon cross a footbridge over the M11 before continuing along a path alongside the woodland of Posterniane Spring, photo 6. 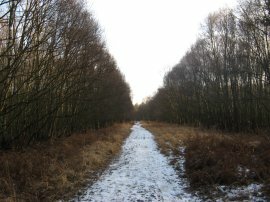 There now follows a long and relatively straight stretch of path as the route continues ahead, passing through Birching Coppice, along a path that isn't always as broad and open as in photo 7. 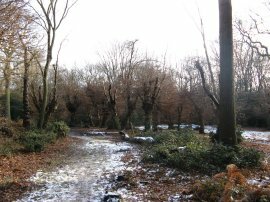 The cold weather of the last couple of weeks had left the ground fairly frozen and there was a thin covering of snow remaining under the trees. This was the day however that the weather turned and the air was already several degrees warmer than recently, and I still felt quite warm, despite the fairly strong wind that was blowing. Leaving the trees the path continues straight ahead besides a number of large open fields, photo 8, in one of which I spotted a small herd of deer. As the path starts to bear to the left the path turns to the right, passing through a hedge to cross diagonally over a narrow section of field before resuming its straight course alongside a number of smaller fields down to join the road in the village of Toot Hill. 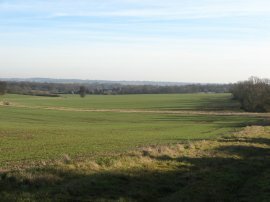 Here the Essex Way turns to the left, following the road through the village until the road bends to the left and the route takes a footpath that continues ahead, past a garage into a field from where there were good views over the surrounding countryside, photo 9. The path turns to the right and having skirted a house then crosses through into a field on the right. The path then once again continues along a fairly straight course besides fields, and then past a small plantation of trees to the buildings of Widows Farm. Just past the buildings the route takes a footpath on the left which descends gently downhill along the edge of a field that has been sub divided into a number of smaller paddocks by scaffolding poles. Having passed through four metal gates the path nears a house and bears to the left to head through a wooden kissing gate into a field. Here the route turns right along the edge of the field to run the short distance down to cross the Greensted Road. Once over the road the route continues heading alongside fields to reach a concrete lined farm track at Greensted. 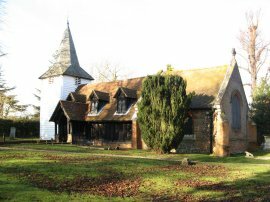 The route turns to the right up this track, passing a few houses to reach the Church of St Andrews at Greensted, more commonly known as the log church, photo 10, where I stopped for a short rest and snack break. 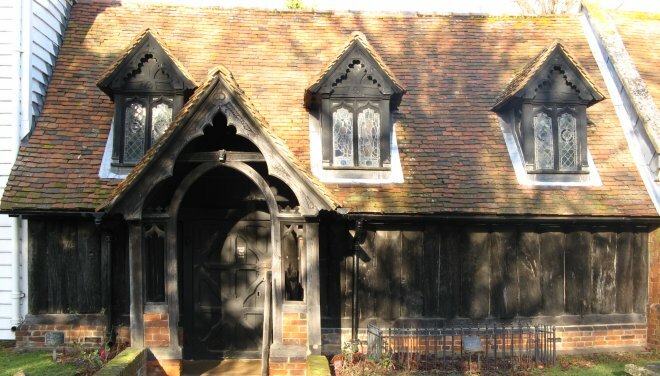 This church is reputed to be the oldest wooden church in the world. The nave is mostly original and is made of large split oak tree trunks. Dendrochronological research in the 1960s dated it to 845. In 1995, however, this date was revised to sometime between 1063 and 1108 which is still pretty ancient. The Essex Way turns left past the front of the church and heads back out to cross over a couple of grassy fields. At the end of the second field the route crosses over a driveway and heads through a small group of trees before entering into a large field which the route heads straight across to Bansons Lane in Chipping Ongar. 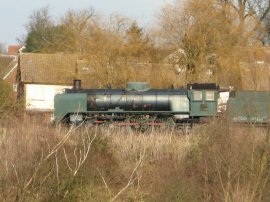 Approaching the end of the field I could see some of the engines belonging to the Epping Ongar Railway on the far side of the field, photo 12. 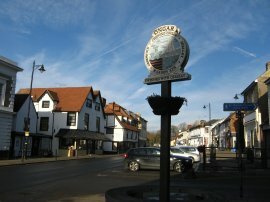 From the field it is just a very short walk up Bansons Lane, past a Sainsburys, to Ongar High Street where the Essex Way turns to the right and heads down the High Street to St Martins Mews where I finished this stage of the walk, besides the village sign, photo 13. At this point I had walked 7.28 miles along the Essex Way which made a good start to the walk. The day after I completed this stage one of my workmates lent me a copy of the AA "Exploring Britain's Long Distance Paths" book which features the Essex Way and mentioned that "As Chipping Ongar is at the end of the Central Line it is a simple matter to return to Epping from here". Sadly though this service stopped running some 14 years ago and thus I was left to walk back. I managed to walk on different paths for most of the way back to the car at Epping and the total distance for the days walk was 14 miles. Reaching the car I felt quite tired, this was my longest walk since mid October, and also I had filled my new rucksack with lots of un-needed odds and ends which meant it weighed rather heavier than normal; next time I will carry a bit less!